For guests, the lobby is the first interior area of a hotel they’ll see, making it all about an impactful first impression. Design firms are taking a new approach to lobby spaces, allowing for more flexibility to make this first impression more of a memorable one. MatchLine Design Group is helping brands stand out through these reinvented spaces. 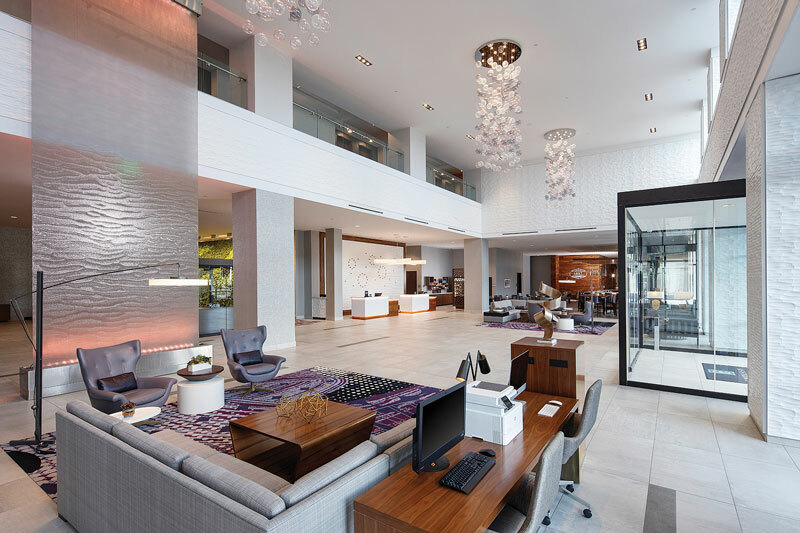 “The lobby sets the tone for the whole guest experience, making it essential to craft a lobby that mirrors the personality of the brand, while also meeting the expectations of guests,” said Lesley Hughes-Wyman, principal of MatchLine Design Group. “To accomplish this, each element must come together to tell the larger narrative, capturing functionality in tandem with visually distinctive designs representative of the brand.” Hughes-Wyman also recognizes the importance of creating that “wow moment” for guests. “Lobbies essentially operate as the eyes into what the guest will experience during their stay. In walking through the lobby, guests are able to instantly gauge what amenities they have available to them; whether it’s a plug-in space for answering emails, or it’s a restaurant to try with fellow guests later on, the guest is given an idea as to what role the hotel will play in their visit,” Hughes-Wyman said. Executive board member of design firm Wilson Associates, Vincent Liew, agreed, noting how lobby design is a major component in setting the tone. 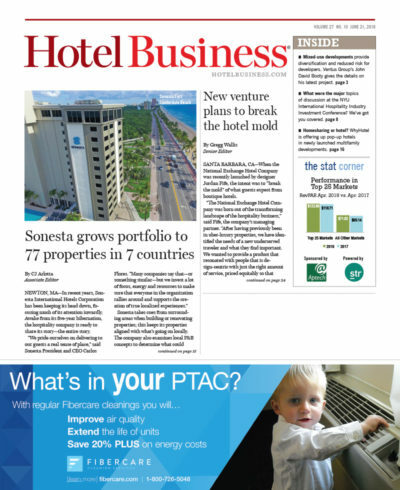 “Hotel lobbies give leisure and business travelers alike a feeling of arrival to their destination. Five-star hotel lobbies go a step further, creating an experience and a destination unto itself for guests,” Liew said. So how do firms create this type of space? Is it about staying on top of ever-changing trends, or staying true to classic design? Perhaps, it’s hints of both. Hughes-Wyman also added that current trends are leaning toward all-in-one concepts, which combine registration, restaurants and lounges into one larger, open space. Reception desks are also evolving, as many are installing pod-like stations, allowing for increased engagement between employees and guests and improved customer service. On the other hand, some reception areas are functioning with a single desk, encouraging guests to check-in on their phones. Wilson Associates also aims to incorporate the classic with the contemporary, blending updated design with traditional elements. “Today’s guests appreciate hospitality spaces that celebrate history with something contemporary,” Liew said. New incorporations may include art installations, sculptures, interactive exhibits and creative floral arrangements. MatchLine also uses art to keep up with trends. Hughes-Wyman said that oversized materials and statement artwork help create open-hall-style lobbies. While lobbies provide designers with the opportunity to let creativity and innovation build the foundation for guests’ experiences, the first impression isn’t the only aspect of a guest’s stay that designers and hotel operators are attune to. Rethinking reception areas is a natural extension of lobby design that can capture guest interaction. The goal is to create a space that’s so inviting and comfortable, guests spend more time in lobbies and, ultimately, spend more at hotels’ bars and restaurants. “These lobbies—combined with design-driven restaurants, bars, lounges and retail spaces—invite guests to stop, look and wander through spaces that create a unique experience achieved either through local charm or grandiose luxury,” Liew said. According to Hughes-Wyman, all aspects of a guest’s stay are interconnected. “F&B is very much a part of this. F&B, whether it’s in the form of take-away, pre-prepped meals or in an integrated bar space, creates more personalized moments for guests and drives revenue for operators,” she said.